I have been following with interest the unfolding drama in my former hometown of Springfield, Ohio who finally has passed an ordinance to outlaw discrimination based on sexual preference. However, as I read with interest, I found the giant "religious loophole." Meaning, you can still discriminate for religious reasons. At least that is the way I read it. Also, I didn't find a word about "gender discrimination" ...or protection for transgender women or trans men. I suppose any movement in a very conservative old town is a good move, but it could have been better. Speaking of better, check this out, from Vermont's Seven Days: "Christine Hallquist is about to make history — or at least give it her best shot. The CEO of the Johnson-based Vermont Electric Cooperative is poised to announce a run for governor as a Democrat. If she were to win the August primary, she would become the nation’s first openly transgender, major-party candidate for governor. It was only last November that Danica Roem of Virginia became the first openly transgender person to win a race for a state legislative seat. A potential governorship? Now, that's history. 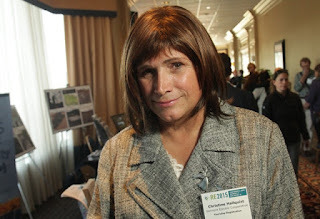 Hallquist is nationally known in utility circles and is a respected expert on energy matters in the Vermont Statehouse. But she’s never been tempted to enter politics herself — that is, until Donald J. Trump won the presidency. “There are strong headwinds from Washington that threaten [Vermont’s] way of life and finances,” she said, explaining her move toward candidacy. Before that, Hallquist would have to win a Democratic primary featuring 13-year-old Ethan Sonneborn and environmental advocate James Ehlers — which, at first glance, seems like a pretty good bet. Party leaders have welcomed Ehlers’ candidacy but have also continued to beat the bushes for candidates with a better shot at winning. And they are very happy to see Hallquist enter the arena. "